We’ve approached every detail with the care an artist would give to his or her masterpiece. Our heated pool is large enough for laps and is has hot tub right next to it. The front desk staff and room service are available day and night, so you can get everything you need exactly when you need it. All of our rooms come with a flat screen TV, complimentary Wi-Fi. Below are some of our favorite amenities we’ve curated to give you an intimate and comfortable experience. Let yourself be feel at home with the sapcious kitchen and living room. In each apartment, you’ll find every essential to have a regular routine. Each suite has a unwinding view to enjoy when at home. It's no secret that some hotel shampoos and soaps make you dry and itchy. We approached organic soap makers ProTerra to craft coconut-vanilla, and natural oil-based toiletries that leave your hair and skin soft, smooth, and are organic made. 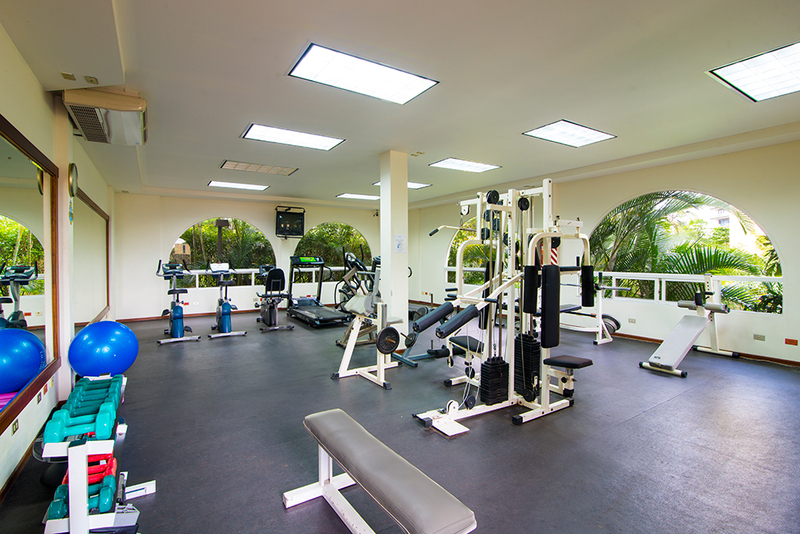 Keeping up with your routine during business trips is a great way to avoid stress, that's why we offer a complete gym available for our guests. The safety of blowing off some steam at the elliptical or lifting weights in a quiet place just steps away from your suite, gives you everything you'll need to feel closer to home. Our hotel is inspired by the comfort of your own home, translated to your holidays or business trip. Our on-site restaurant and cafe, Sarapiquí, is influenced by local ingredients and offers you a wonderful breakfast everyday with fresh fruit and various breads. That’s right, you can have a complete breakfast before going our to your tours. The busy business life stays in the outside when you cross our doors. Feel free to take a dip in any of our two pools and make your day a more interesting one. The pool space is great to have a fun family morning. We also have a jacuzzi if you want to unwind on your time off. Keeping your worktime in mind we built a quiet and connected Business Center, designed to give you privacy for remote meetings or calls. Located upstairs from the Front Desk you'll have this space to connect and print any information. If you want to arrive to Costa Rica without worries, just let us know when confirming your reservation your arrival or departing dates, to arrange your pick up. Avoid getting lost arriving home by riding with our shuttle. This service is available for stays of over 2 nights. Arrange shuttle at least 48 hours prior arriving-leaving. Our philosophy is making a family and home a focused place for your trips . And home is where your loved ones are, that includes your pet, of course. We love to have furry friends over, and have a special spot in the garden for them, as well as a walking service if you need it. Playtime in a safe and fun place outdoors. Have a time of relax while the kids run in a safe environment. Afternoons during summer time are gorgeous to spend outdoors, so don't miss out on the orange sunsets and balmy afternoons.